Notre Dame historian Olivia Remie Constable has been awarded a fellowship from the John Simon Guggenheim Memorial Foundation for her book project Christian Perceptions of Muslim Identity in Medieval Spain. Among other things, her work will examine Christian attitudes toward Muslim dress and appearance and whether Muslims could engage in public religious expressions, teach Arabic to their children, and maintain bathhouses, schools, cemeteries, and other separate spaces important to the continuity of their culture and religion. A professor in the Department of History and director of the University’s Medieval Institute, Constable specializes in the social, economic, and cultural history of the Mediterranean world, particularly the Iberian Peninsula. 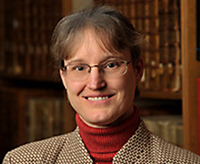 Her current research focuses on the time between the 12th and early 16th centuries. Out of several thousand applications each year, the Guggenheim Foundation selects approximately five percent as fellows, based on exceptional academic achievements and on continued promise of exceptional work in the future. Two of this year’s winners are from Notre Dame—both of them medievalists. “I think this is testimony to the strength of medieval studies at Notre Dame, to the strength of our medievalist faculty, and to the support we get from the College of Arts and Letters,” Constable says. Previous Guggenheim recipients with ties to the Medieval Institute include Kathryn Kerby-Fulton (Department of English), Ann Astell (Department of Theology), and John Van Engen (Department of History).